In the present study, we manufactured rice miso supplementary with black soybean, buckwheat and adzuki bean. We analyzed DPPH radical scavenging activity, melanoidin, peptide, reducing sugar content, and lipase inhibitory activity in various rice miso products at different fermentation periods (3, 6, 24, 36 months), respectively. DPPH radical scavenging activity, melanoidin content and lipase inhibitory activity in various rice miso products increased with prolonging the fermentation period. We found positive relationships between melanoidin content and DPPH radical scavenging activity, and lipase inhibitory activity. The correlation coefficients were more than 0.75, respectively. 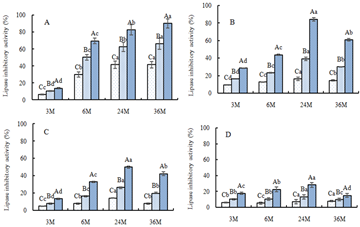 Rice miso supplementary with black soybean (RM-BS), rice miso supplementary with buckwheat (RM-BW) and rice miso supplementary with adzuki bean (RM-AB) exhibited significant higher DPPH radical scavenging activity, melanoidin and lipase inhibitory activity than RM (rice miso; control), respectively. We considered that due to prolonging the fermentation period, more and more starch and protein contained in RM-BS, RM-BW and RM-AB were decomposed into reducing sugar, peptide and amino acid, than those of RM. So thus rice miso supplementary with black soybean, buckwheat and adzuki bean could improve DPPH radical scavenging activity and lipase inhibitory activity of traditional rice miso products, which may be because of plenty of melanoidin was produced through the amino acid-glucose reactions. These results would utilize in the research on development functionality of rice miso products. Stokes, C., Peet, M., “Dietary sugar and polyunsaturated fatty acid consumption as predictors of severity of schizophrenia symptoms,” Nutritional Neuroscience, 7(4). 247-249. Aug 2004. McCreadie, R.G., “Diet, smoking and cardiovascular risk in people with schizophrenia: descriptive study,” British Journal of Psychiatry, 183. 534-539. Dec 2003. Cimo, A., Stergiopoulos, E., Cheng, C., Bonato, S., Dewa, C.S., “Effective lifestyle interventions to improve type II diabetes self-management for those with schizophrenia or schizoaffective disorder: a systematic review,” BMC Psychiatry, 12: 24. Mar 2012. Correll, C.U., “Prevalence, incidence and mortality from cardiovascular disease in patients with pooled and specific severe mental illness: a large-scale meta-analysis of 3,211,768 patients and 113,383,368 controls,” World Psychiatry, 16(2). 163-180. Jun 2017. Crump, C., Winkleby, M. A., Sundquist, K., Sundquist. J., “Comorbidities and mortality in persons with schizophrenia: A Swedish national cohort study,” American Journal of Psychiatry, 170. 324-333. Mar 2013. Sundström, J., Risérus, U., Byberg, L., Zethelius, B., Lithell, H., Lind, L., “Clinical value of the metabolic syndrome for long term prediction of total and cardiovascular mortality: prospective, population based cohort study,” British Medical Journal, 332. 878-882. Apr 2006. Kwon, D.Y., Daily, J.W., Kim, H.J., & Park, S., “Antidiabetic effects of fermented soybean products on type 2 diabetes,” Nutrition Research, 30(1). 1-13. Jan 2010. Santiago, L.A., Hiramatsu, M., and Mori, A., “Japanese soybean paste miso scavenges free radicals and inhibits lipid peroxidation,” Journal of Nutritional Science and Vitaminology, 38(3). 297-304. Jul 1992. Watanabe, H., “Biological efficacies of Miso,” Journal of the Brewing Society of Japan, 105(11). 714-723. Nov 2010. Ito, A., Gotoh, T., & Fujimoto, N., “Chemoprevention of cancers by miso and isoflavones,” Journal of Toxicologic Pathology, 11(2). 79-84. Jun 1998. Yoshikawa, H., Kuwashima, C., Kotaru, M., “α-amylase inhibitors in the seeds of the genus Phaseolus and their characteristics,” Research bulletin of Kyoto Koka Women's University, 47. 227-237. Dec 2009. Saito, Y., Nishi, S., Koaze, H., Hironaka, K., and Kojima, M., “Antioxidant and Inhibitory Activity on α-Amylase and α-Glucosidase in Legume Polyphenols,” Journal of the Japanese Society for Food Science and Technology, 54(12). 563-567. Jan 2007. Acquaviva, R., Russo, A., Galvano, F., Galvano, G., Barcellona, M.L., Li Volti, G., and Vanella, A., “Cyanidin and cyanidin 3-O-β-D-glucoside as DNA cleavage protectors and antioxidants,” Cell Biology and Toxicology, 19(4). 243-252. Aug 2003. Lin, W.H., Yang, H.W., Hsu, C.K., Jhan, H.K., Lo, D.Y., “Black Soybean Shows Protective Function against Carbon Tetrachloride-induced Liver Damage in Sprague-dawely Rats,” Journal of Botanical Sciences, 5(1). 7-15. Dec 2016. Lee, L.S., Choi, E.J., Kim, C.H., Sung, J.M., Kim, Y.B., Seo, D.H., Choi, H.W., Choi, Y.S., Kum, J.S., Park, J.D., “Contribution of flavonoids to the antioxidant properties of common and tartary buckwheat,” Journal of Cereal Science, 68. 181-186. Mar 2016. Holasova, M., Fiedlerova, V., Smrcinova, H., Orsak, M., Lachman, J., Vavreinova. S., “Buckwheat - the source of antioxidant activity in functional foods,” Food Research International, 35. 207-211. Dec 2002. Jiang, P., Burczynski, F., Campbell, C., Pierce, G., Austria, A., Briggs, C.J., “Rutin and flavonoid contents in three buckwheat species Fagopyrum esculentum, F. tataricum, and F. homotropicum and their protective effects against lipid peroxidation,” Food Research International, 40(3). 356-364. Apr 2007. Oh, M.J., Choi, H.D., Ha, S.K., Choi, I., Park, H.Y., “Immunomodulatory effects of polysaccharide fraction isolated from Fagopyrum esculentum on innate immune system,” Biochemical and Biophysical Research Communications, 496(4). 1210-1216. Feb 2018. Durak, A., Baraniak, B., Jakubczyk, A., Świeca. M., “Biologically active peptides obtained by enzymatic hydrolysis of Adzuki bean seeds,” Food Chemistry, 141(3). 2177-2183. Dec 2013. Kojima, M., Yamashita, S., Nishi, S., Saito, Y., and Maeda, R., “Anti-oxidative effect and Liver Protective Action of Adzuki Polyphenol,” Journal of the Japanese Society for Food Science and Technology, 53(7). 386-392. Jul 2006. Kojima, M., Nishi, S., Yamashita, S., Saito, Y., and Maeda, R., “Smaller Increase in Serum Cholesterol Level in Rats Fed an Ethanol Extract of Adzuki Bean Seeds,” Journal of the Japanese Society for Food Science and Technology, 53(7). 380-385. Jul 2006. Jiang, C.Y., Ci, Z.H., Kojima, M., “Antioxidant Activity, α-Glucosidase and Lipase Inhibitory Activity in Rice Miso with Kidney Bean,” Journal of Food and Nutrition Research, 6(8). 504-508. Aug 2018. Ikeda, R., Ohta, N., & Watanabe, T., “Changes of Isoflavones at Various Stages of Fermentation in Defatted Soybeans,” Journal of the Japanese Society for Food Science and Technology, 42(5). 322-327. May 1995. Martins, S.I.F.S., Van Boeke, M.A.J.S., “Melanoidins extinctioin coefficient in the glucose/glycine Maillard reaction,” Food Chemistry 83(1). 135-142. Oct 2003. Olson B, Markwell J., “Assays for determination of protein concentration,” Current Protocols in Protein Science, Unit 3.4.16, May 2007. Han, L.K., Gong, X.J., Kawano, S., Saito, M., Kimura, Y., Okuda, H., “Antiobesity Actions of Zingiber officinale Roscoe,” Journal of the Pharmaceutical Society of Japan, 125(2). 213-217. Feb 2005. Liu, J.Y., Gan, J., Yu, Y.J., Zhu, S.H, Yin, L.J., Cheng, Y.Q., “Effect of laboratory-scale decoction on the antioxidative activity of Zhenjiang Aromatic Vinegar: The contribution of melanoidins,” Journal of Functional Foods, 21. 75-86, Mar 2016. Yamagata Y., “Proteolytic Enzymes of A. oryzae,” Kagaku to Seibutsu, 54(2). 109-116. Jan 2016. Yoshioka K, Suzuki Y, Morikawa K., “Changes in Saccharide Contents and Color of Homemade Rice Miso during Fermentation,” Bulletin of Osaka Prefectural College of Health Sciences, 3. 57-62, Dec 1997. Kan, L.J., Nie, S.P., Hu, J.L., Wang, S.N., Bai, Z.Y., Wang, J.Q., Zhou, Y.M., Jiang, J., Zeng, Q., Song, K., “Comparative study on the chemical composition, anthocyanins, tocopherolsand carotenoids of selected legumes,” Food Chemistry, 260(1). 317-326. Sep 2018. Kim, J.S., & Lee, Y.S., “Antioxidant activity of Maillard reaction products derived from aqueous glucose/glycine, diglycine, and triglycine model systems as a function of heating time,” Food Chemistry, 116(1). 227-232. Sep 2009. Adams, A., Kitrytė, V., Venskutonis, R., & De Kimpe, N., “Impact of lipid oxidation-derived aldehydes and ascorbic acid on the antioxidant activity of model melanoidins,” Food Chemistry, 135(3). 1273-1283. Dec 2012. Park, N.Y., Rico, C.W., Lee, S.C., Kang, M.Y., “Comparative effects of doenjang prepared from soybean and brown rice on the body weight and lipid metabolism in high fat-fed mice,” Journal of Clinical Biochemistry and Nutrition, 51(3). 235-240. Nov 2012. Park, N.Y., Rico, C.W., Lee, S.C., Kang, M.Y., “Coffee Reduces Liver Damage in a Rat Model of Steatohepatitis: The Underlying Mechanisms and the Role of Polyphenols and Melanoidins,” Hepatology, 52(5). 1652-1661. Nov 2010.